Adam- I worked on the West Portal mural. One of the interesting things to look at in it speaks to Millard’s artistic sensibility. When the mural was almost completed and lying on the studio floor, Millard popped in one day, took one look and had us place lavender smalti into the dark background area. Not much , just one tile in about each square foot. This really made the flat background vibrate. I think his most radical design departure was a rare interior mosaic designed after his visit to Guatemala in the early seventies. He came back with a traditional embroidered blouse and we did a twelve foot tall copy of it. This was for the Lakewood branch. 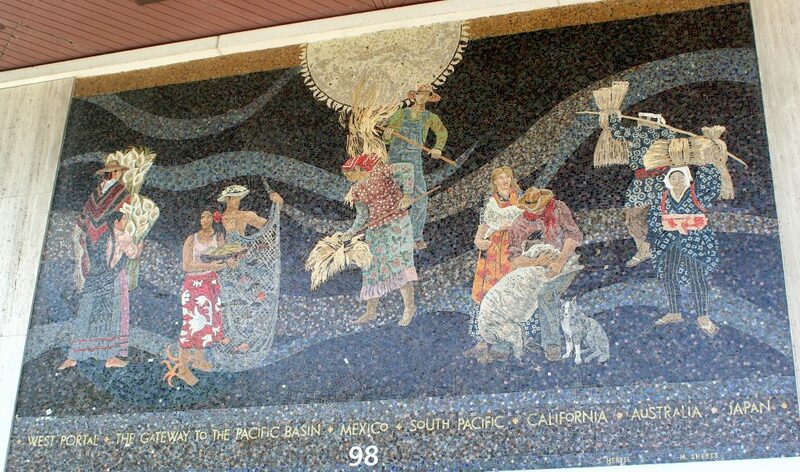 It was a large building with no exterior mosaic other than a large angled planter that he covered with a fish mosaic. I am going by there this week to see if the two mosaics are still there. This was a point of design departure for Millard. Hope I can take some photos for you. Another design departure was the Vallejo branch, which was just stylized birds. Thanks for reminding me about MIllard’s final touch here — you had mentioned it to me. I will look more into the Lakewood branch, and I would appreciate photos; I have seen photos of the planter and sculptures outside, but have not been there to look around. I am new to San Francisco and was meeting a friend in West Portal when I came upon this MAGNIFICENT mural. I took several photos, and the folks in the bank (now Chase) knew nothing about it…hardly knew it was there. This is public art at its best—a national treasure. I wish there had been a brochure in the bank explaining the history of such a piece. I am glad we have the internet where I could so easily look it up. I wrote you an email instead.